Move on. Big issues in the world. Cleaning up public spaces is something we just need to do every few generations. Making the fountain ADA accessible, modernizing walkways, breathing life back into the green-spaces, creating some cosmetic order… all good. Lots of people stopped using this park – because it was run down and overwhelmed by illegal behavior. You’ll see – in no time you’ll be back in your beloved park enjoying it with the rest of us. No one will remember these protests/sentiments. As we’ll have a great park to enjoy. Sorry Ray, but that isn’t what is going on here. Cleaning up the park is one thing. Completely re-doing it without any input from the community and what the community needs/wants is completely another. Actually read the blog and you’ll see we’re not protesting cleaning it up and taking care of it. Quite the opposite actually. I don’t think anyone would have complained about fixing what was broken, and shining up the rest. But that isn’t what is happening. They are lighting a match to our park and completely redesigning it when all it needed was to be repaired, cleaned, and actually maintained. They are spending millions on this redesign, but have they talked to anyone in community about we want and need for our park? Nope. That is what is wrong here. These plans came together with 0% community input. If they had talked to the community, they would have learned that 98% of people liked it the way it was with repairs and cleaning. What is happening is that The Parks Department and a bunch of donors have taken the reigns on these plans and are not involving the community in any way. Do the current plans take into consideration how people use the park, what people like and enjoy the most about the park, and what makes this park special? Nope. Not at all. They just on the surface make it “prettier”. Are these current plans functional to how people use this park every single day? Nope. Again, that is what is wrong here. That is what we are protesting on this blog –not whether or not we clean and repair our beloved park after a long period of complete neglect. That is what NEEDED to happen. That is all we wanted them to do! 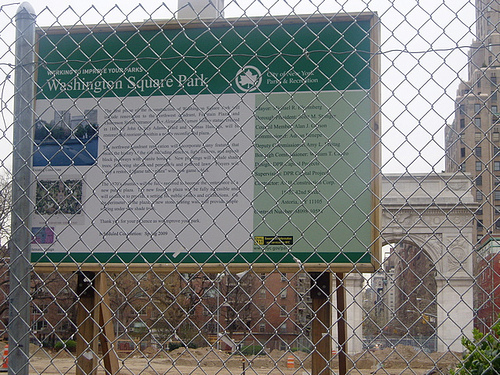 We are protesting a complete redesign of Washington Square Park that threatens the innate character of this unique, historical, well used, much loved space. Making it “prettier” and throwing out the rest is not a plan worthy of this park. Period. “breathing life into the green spaces,” “modernizing walkways,” “making the fountain ADA accessible *(and the City is still missing the boat on many things in relation to ADA – NOT putting in place things the disabled community actually wanted or felt they needed and throwing other elements in just to push forth their agenda..) – all good things. The issue is the close-to-total destruction of what was/is. “A lot of people stopped using the park” Well, A LOT Of people still use it and like it. Who decides? Like you, Ray, the people who like it now would like to see it MAINTAINED and shown some ‘love’ vs. given plastic surgery, as if it never mattered. Washington Square Park IS a GREAT PUBLIC SPACE – as is. If it was maintained as was necessary over the years, we probably wouldn’t even have any disagreement. The Parks Department let the Park fall into disrepair. There are serious issues with the way the Parks Dept is run. It has become, under Commissioner Benepe, more about p.r. and splashy redesigns vs. maintenance of the City Parks. The money goes towards unnecessary projects – but they provide good photo ops. In a budget crisis, it’s a bit unconscionable. The REASON the argument over our public space is important is because it is emblematic of many changes both (a) societal and (b) pushed through by the Bloomberg Administration in our City. These changes are sweeping across all the boroughs and many lament because of the WAY they are done and WHAT the content of the changes is. Tara, Good points. Thanks for your input. The Parks Department would (will) argue that they did give the community opportunity to comment. That’s part of the problem. There were many exercises the community was put through and allowed to talk in many settings — but not LISTENED to. The Parks Department had already decided what they wanted into play. They refused to reveal key details and worked to manipulate the process in a way that was slick, unfair, and not how our elected officials should be proceeding. Yeah, they can still talk to the community, but whether or not they listen/care about what we say is really what counts. Those plans were not put together with the community’s input integrated into them at all, and it really shows. I mean the plans just seem so random, like “Hey lets put a bunch of gigantic flower pots over there! Why not! And hey, let’s shrink the height of the stage! Sounds good! Hey, let’s move the fountain over there, name it after the Tisch family, and shrink the whole general area! Awesome!” Thanks for your update on this. It is very revealing indeed.